Canada's manufacturing sector can build on its strengths and refocus its efforts on high-value opportunities arising from development in the energy sector, said Honourable Jim Prentice, vice-chairman of CIBC. Speaking to the Toronto Board of Trade, Prentice identified three things he thinks are necessary to address the challenges facing the sector. Find out what they are. Statistics Canada says the pace of economic growth slowed to 0.4 percent in the fourth quarter of 2011 after a third-quarter increase of one percent. What role did plant and equipment investment play in the increase? Find out here. Orders for motion control products jumped 17.7 percent in 2011, according to new statistics released by the Motion Control Association, the industry's global trade group. Learn more. CSA Group has unveiled its new global logo and tagline to consolidate all of its divisions under a unified brand identity. Learn more. The newly-appointed head of a sweeping review of federal aerospace and space policies says he has no interest in producing a report that will just end up in a filing cabinet. What will the review examine and when will it be released? Find out here. Autodesk, Inc. has announced the immediate availability of Autodesk PLM 360, the cloud-based alternative to product life cycle management that the company unveiled last November at Autodesk University. Learn more. Omron Industrial Automation has introduced its eLearning portal, featuring 10 introductory courses on types, functions and general knowledge of factory automation equipment. Learn more. 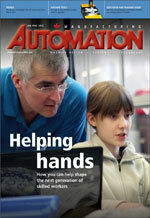 Want to be notified of the latest Canadian automation, manufacturing and system design news and events as they're posted? Then join Manufacturing AUTOMATION on Twitter. Don't get left behind — get caught up! To sign up or join us, click here. Calstone is a Canadian, family-owned business that creates and manufactures metal furniture products. The Scarborough, Ont.-based company prides itself on being green. We go inside Calstone's plant to learn about their many environmental initiatives, including their remanufacturing program, and talk to the company president about his goal of building a company that is both sustainable and successful. Industry accounts for more than 40 percent of worldwide energy consumption. This article will examine the energy savings and efficiency enhancement that can be achieved through the use of variable frequency drives and more intelligent industrial automation devices communicating over Ethernet technology. To improve its position in the global energy market, Siemens Energy Power Transmission decided to increase its manufacturing capacity by building an entirely new conduit manufacturing plant. We take a look at how plant simulation allowed the company to lower costs and eliminate bottlenecks — all before the plant was constructed. This month's column outlines the role arc-resistant motor control centres (MCCs) play in helping contain arc energy, as well as best practices for implementing an effective arc-resistant MCC to help reduce risk. Plus: The latest news and trends, as well as electronic components, HMIs, machine vision and inspection technologies, sensor products, enclosures and workstations, programmable control products and RFID technologies. March 9: Increasing Productivity through the Adoption of ERP Systems - Markham, Ont. March 20-22: FABTECH Canada - Toronto, Ont. April 3-4: The Ontario Feed-In Tariff Forum 2012 - Toronto, Ont. April 30 - May 2: The Ontario Technological Skills Competition - Waterloo, Ont. May 1: The first annual MIN Manufacturing Summit - Kitchener, Ont. May 14-16: Montreal Manufacturing Technology Show - Montreal, Que. Got an event you want us to include on the website? Please send an e-mail to editor Mary Del Ciancio: mdelciancio@annexweb.com.